A popular and slightly bizarre stop on any tour of Grand Cayman, Hell is a tiny village that features strange black limestone rock formations that are said to resemble the Underworld. 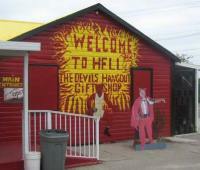 Though Cayman residents are generally religious, residents of Hell show their sense of humour to tourists with a bright red post office that sends 'Postcards from Hell', and a gift shop where 'Satan' passes out souvenirs and inquires of visitors: 'How the Hell are you?' The village, home to only 60 people, also features a restaurant and bar. The natural rock formations, comprised of the spiky 'Ironshore' rock found elsewhere on the island are interesting, and the residents have turned Hell into a quirky island attraction for those exploring beyond the beaches and resorts.